Pauline McKay and David Lawson will be at both gatherings. Developers is in the second year of a plan to improve family incomes and prepare for the next disaster—94-98% of homes were damaged or destroyed when Typhoon Haiyan hit the Philippines in November 2013. Your donations have bought corrugated iron roofing for shelter, materials to plant 65,000 root crops and fruit trees, built a local farmer’s market, and run disaster preparedness training. This year they will plant more crops to secure food supply and income earning opportunities. They are learning to make banana chips and ketchup and looking at other ways to earn more from their crops. 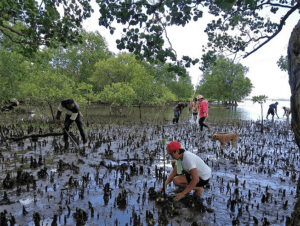 Thanks to those who purchased Mangroves through the Gifted programme and donations for climate justice, Developers was able to begin planting mangroves to protect coastal villages from tidal surges and improve habitat for birds and marine life. A team of 20 planted 2,000 propagules purchased from local villagers and 81 teachers and students planted 162 propagules they gathered themselves as part of science classes and gained a recreational park. Read our report. With Father’s Day a week away, there is enough time to order something Gifted—cards if you are quick or email: electrical training for a young refugee or offset his carbon footprint with mangroves. Close to 900,000 people shelter in Bangladesh with little hope, unable to safely return home to Myanmar. Monsoons and landslides add to their troubles. Donations to the Rohingya Appealwill help with much needed food, water, shelter, sanitation, medical treatment and psychosocial care. ACT Alliance India is responding to those urgently needing relief in Kerala after flooding has affected more than 1 million people. ACT Alliance is supplying clean water, hygiene supplies and sanitation, shelter materials, bedding, household utensils, and food or cash transfers. Aftershocks following a magnitude 6.9 earthquake have devastated Lombok Island, claiming more than 500 lives. ACT Alliance Indonesia is distributing clean water, tarpaulins, blankets and mattresses as well as installing latrines and providing health services, subject to support. Peace talks continue to progress in South Sudan, inching towards ending the five year conflict that has caused alarming levels of violence and deprivation—7 million people are in need. The Council of Churches has championed peace at every level throughout the conflict. MaridiFM run by partner Maridi Service Agency has played an important role in keeping locals informed about national politics and the most recent agreements. Please give to the South Sudan Appeal. Pray for Zimbabwe as its citizens await a court ruling on election results. International Programmes Coordinator Trish Murray visited partner Ama Takiloa in late June. She reports they are well placed to assist people who have missed out on relief efforts by providing community support, rainwater system repair or replacement, and assistance with food and livelihoods. Thanks to those who supported the Cyclone Gita Appeal. Donations to the PNG Earthquake Appeal have helped with the purchase and distribution of building materials in Hela province. CEPAD has thanked you for your prayers and support after the government crackdown following large protests over austerity cuts. With other groups CEPAD called for peace and an end to violence that claimed 300 lives and pushed 28,000 to flee to Costa Rica. Road blockades have been lifted and staff have begun visiting the isolated rural communities where they work. CWS wrote to the Minister of Foreign Affairs asking him to raise concerns about human rights and democracy with the Nicaraguan government. Congratulations to the World Council of Churches celebrating 70 years of working for church unity, peace and justice. Sangeetha is moving from her traditional home in the forests of South India. Read the Winter Story to find out how your support is Creating a New Path For the Future for some of India’s Tribal people. Maire Leadbeater has launched See No Evil, looking at West Papua and New Zealand’s foreign policy towards West Papua. Look out for Pauline and David if you are attending these national meetings. They welcome your feedback and questions. Update provides news, information, and stories. Reproduction of items is encouraged with attribution to CWS. Current and back issues are available.